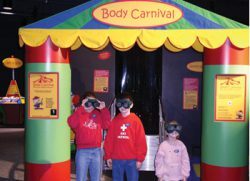 Body Carnival is a carnival-themed interactive exhibit that explores the connections between perception and the laws of physics in the human body. Children and adults alike will enjoy learning about their bodies while investigating force, pressure, light, color and more. You can crawl through a giant artery to see and hear the effects of restricted blood flow, test your balance in the 10-foot Dizzy Tunnel or don a pair of vision-distorting goggles and discover how sight affects your ability to walk straight. With 18 stations there’s a lot to explore, so join us and discover more about your body through science! Local support is provided by Next Level Urgent Care.